An Uptown Portrait is a bi-monthly photo series by journalist Amaris Castillo (@AmarisCastillo). The portraits capture those who reside in upper Manhattan and their candid quips on their side of town. 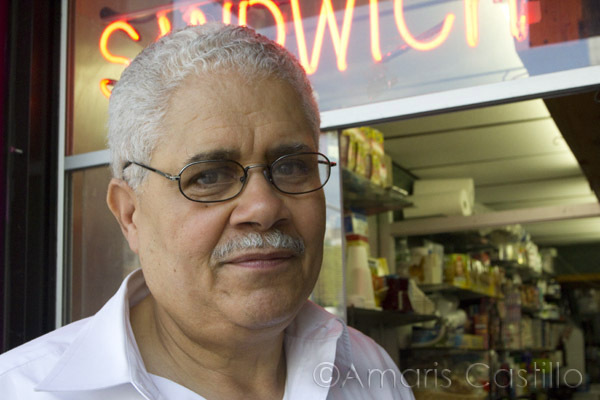 A native of the Dominican Republic, Hugo Salcedo first moved to Washington Heights with his uncles in 1965. “We liked it here,” the 67-year-old says. Salcedo, who owns a salon discount store by W. 168th St. and Audubon Ave., says much in his neighborhood is close by: schools and easy transportation to and from the Bronx and New Jersey. He remembers moving to the East New York neighborhood of Brooklyn a few years after arriving to the city. The bespectacled man didn’t like it – he says it wasn’t safe. After three years in Kings County, he packed his bags and returned to his neighborhood. He hasn’t left since. "HOLY UPTOWN HOOKAH BONGS, BATMAN!"